Sightseeing cruise by the electric Ecoboat is a unique experience. As you sit in the silent Ecoboat you will experience the nature with all senses. You can hear the sound of the waves as the seats are close to water level. You can see the beatifull landscapes via the big windows and smell the scent of the lake. The cabin of the Ecoboat is like a comfortable living room on waves. Your friendly skipper tells you stories of the lakes and he might even play some accordeon finnish style. 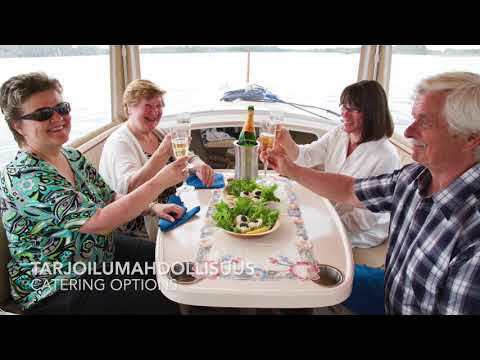 Gather your friends and book your own private Ecoboat sightseeing cruise in lake Saimaa. You may select the location amongst several alternatives in Varkaus, Puumala, Savonlinna, Kolovesi national park etc. Best service guaranteed ! Your private Skipper is Mr Arto, a multitalent wilderness guide from lake Saimaa. Arto speaks fluent english, french and helpfull german, russian, swedish, italian. Arto guarantees the best service!